Catherine Josephine "Jo" Van Fleet (December 29, 1915 – June 10, 1996) was an American theatre and film actress. Known primarily for playing roles older than she was, her career spanned over three decades, and she won an Academy Award as well as a Tony Award. Born in Oakland, California to Roy Van Fleet and Elizabeth "Bessie" Catherine (née Gardner), Jo Van Fleet established herself as a notable dramatic actress on Broadway over several years, beginning in 1946 in Dorcas in A Winter's Tale, and played Regan in King Lear opposite Louis Calhern in 1950. She won the Tony Award for Best Featured Actress in a Play in 1954 for her performance as Jessie Mae Watts in Horton Foote's The Trip to Bountiful, costarring Lillian Gish and Eva Marie Saint. After her success on the stage, director Elia Kazan brought her to Hollywood to work on screen. Kazan, who had directed her on stage in 1952's Flight to Egypt and 1953's Camino Real, cast her as Cathy Ames in his film adaptation of John Steinbeck's East of Eden (1955); this was her film debut. She won an Academy Award for Best Supporting Actress for her performance. Her subsequent film work was steady through 1960, and included such films as The Rose Tattoo (1955), I'll Cry Tomorrow (1955), The King and Four Queens (1956), and Gunfight at the O.K. Corral (1957). However, her career did not progress as she had hoped. Her friend and mentor, Kazan, once said "Jo stagnated, and, since she knew it, was bitter. And as she became bitter, she became more difficult." In 1958, she was nominated for a Tony Award for Best Actress in a Play for her performance in Look Homeward, Angel, in which she played the acquisitive mother of Anthony Perkins' character. Her later films included Wild River (1960) -- though only 46, Fleet would spend five hours every morning getting into her make-up and applying wrinkles to play the role of an 89-year-old matriarch -- Rodgers and Hammerstein's Cinderella (1965), as Paul Newman's mother in Cool Hand Luke (1967), and I Love You, Alice B. Toklas (1968). Her television work included Alfred Hitchcock Presents, Thriller, Bonanza and The Wild Wild West. Van Fleet was married to William Bales from 1946 until his death in 1990. Van Fleet died in a Jamaica, Queens hospital from undisclosed causes at the age of 80. Her interment was at Flushing Cemetery. She was survived by her son Michael Bales, and a grandson, Arden Rogow-Bales. She has a star on the Hollywood Walk of Fame for her contribution to Motion Pictures, at 7000 Hollywood Boulevard. Wikimedia Commons has media related to Jo Van Fleet. 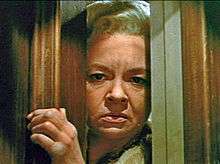 Jo Van Fleet profile, lortel.org; accessed September 2, 2015. 1 2 Date of birth for Jo Van Fleet, californiabirthindex.org; accessed 2 September 2015. ↑ Arden Rogow-Bales profile, imdb.com; accessed August 4, 2015. ↑ Obituary, nytimes.com, June 11, 1996; accessed August 4, 2015.